This is the final post in my series about fast animals. Today, I am writing about a great middle distance runner, the pronghorn. This stocky animal grows up to 87 cm tall and 140 cm long, weighing up to 70kg. 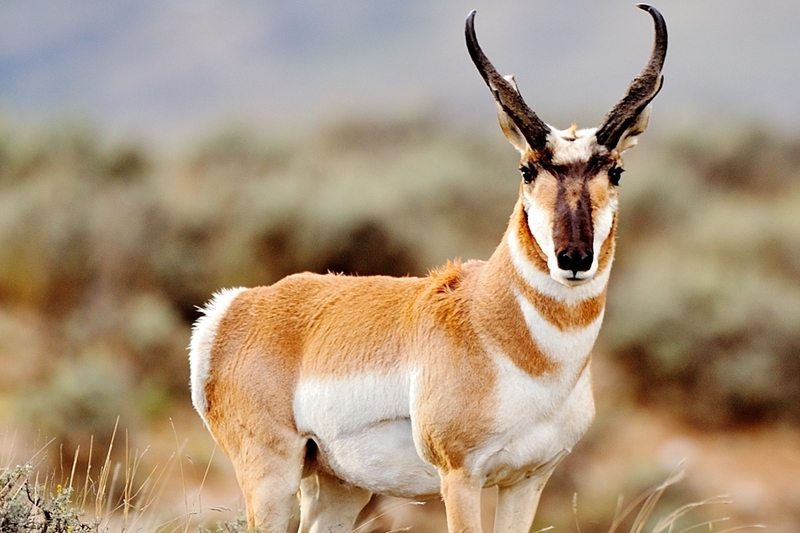 Even though it’s often called a pronghorn antelope, it’s not really an antelope. Its horns look more like a deer’s, but it isn’t a deer either. In fact it belongs to its own family. Pronghorns are the second fastest mammal, only behind the cheetah. However, the pronghorn can sustain its speed for much longer, making it the best long distance runner in the world. They can reach a top speed of 86 kph and run for about 70 kph for a few kilometres. During the non-breeding season, they live in herds of up to 1,000 animals, but become more territorial during spring and summer. The first time a female has a baby, it usually gives birth to one baby, but after that, they will often give birth to twins. Pronghorns live in grasslands and deserts from southern Canada, through the western half of the United States and into Mexico. Due to hunting and habitat loss, their numbers dropped to only about 20,000 animals, but conservation efforts have seen this beautiful species recover to about 700,000, meaning that they are no longer in danger of extinction. Are there any other interesting facts that you would like to share about pronghorns?